With Halloween over, the celebrations still continue! My sister in law's birthday is coming up in over two weeks but due to our busy schedules, we celebrated her birthday early. We enjoyed some much needed family time yesterday to catch up on things and also talk about upcoming holiday plans. Overall, a wonderful time as usual! My mother in law, Marnee, insisted we not bring anything - which was hard for me to do - but I'm also glad we listened. Kind of. (We brought some lemonade lol.) I should have known, Marnee has always has her dinner menus perfectly planned and this dinner was no exception. The showstopper? Dessert of course! 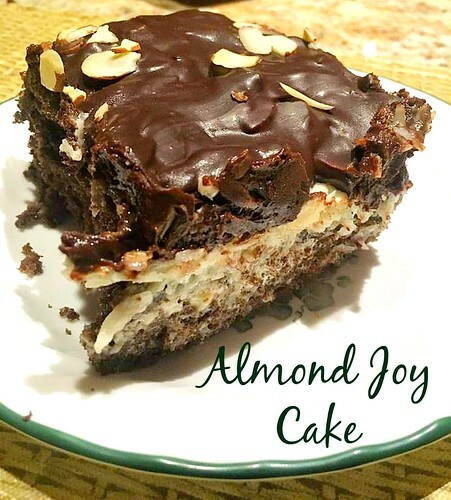 The birthday girl's favorite candy is Almond Joy so Marnee made the most perfect cake to celebrate with - an Almond Joy Cake. This cake is a rich and chocolately dessert that will have you coming back for more. 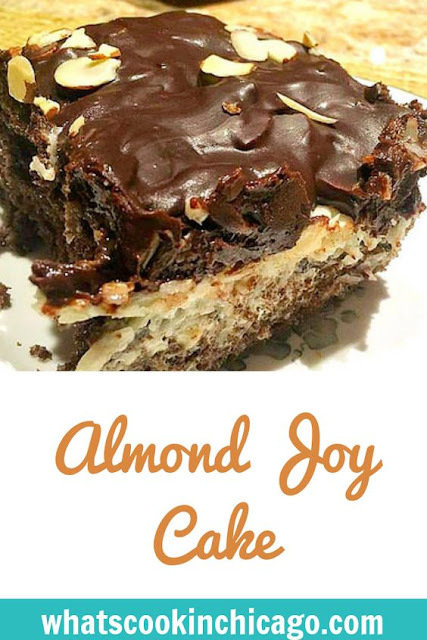 Very much like the candy bar, a chocolate cake is topped with a rich coconut and marshmallow topping, then covered with a chocolate frosting, garnished with toasted almond. Heaven! So if you're still on a candy high from Halloween, this cake will have you overdosing on sugar! Prepare the cake batter according to the package directions and pour into a deep 9 x 13 inch baking pan. Bake as directed, remove from oven and set aside. Meanwhile, in a small saucepan over medium high heat, stir together 1/2 of the can of evaporated milk and 1/2 cup of the sugar; bring the mixture just up to a boil and remove from heat. Immediately stir in the marshmallows until melted through. Stir in the coconut and spread on top of the warm cake once removed from the oven. Note: the coconut marshmallow mixture may be thick - work quickly and drop mixture in dollops, using a spatula to push the coconut layer out as evenly as possible. In a separate small saucepan over medium high heat, combine the remaining evaporated milk, sugar and butter; bring mixture just up to a boil and remove from the heat. Add the vanilla and stir in the chocolate chips until melted and smooth. Stir in about 3/4 cup of the almonds and pour that over the coconut layer. The mixture should be fairly thick, but if it gets too thick, return it to a low burner briefly, stirring until it returns to a spreadable consistency. Sprinkle the remaining 1/4 cup of almonds over the top and let cool completely before cutting.